I am so tremendously blessed with my wonderful readers. Through 37 years and 64 completed novels, my readers keep me going. They mean everything to me  and many of them have actually become good friends. The support I get from them is overwhelming. 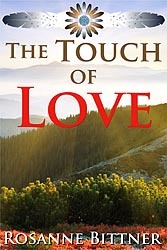 To all of my faithful supporters, I am making available my novella THE TOUCH OF LOVE, a 46-page novella about Robert Kingsley, the half-Indian boy raised by Rising Eagle of my Mystic Indian trilogy, which was previously only available by download from Mightywords.com. 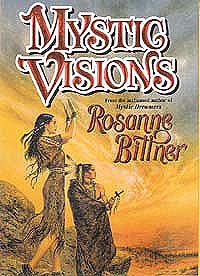 In action, it falls between MYSTIC VISIONS and MYSTIC WARRIORS (Books 2 & 3)..
"For over a decade, Rosanne Bittner has enthralled her readers with tales of adventure and romance in the times before the White Man settled the West. Now, in the tradition of Kathleen O'Neal Gear and W. Michael Gear, the bestselling author of SONG OF THE WOLF and the Savage Destiny Indian series turns her hand to historical fiction with a wonderful new story of Native America sure to capture you and carry you on an adventure of love and hate, good and evil, life and death. 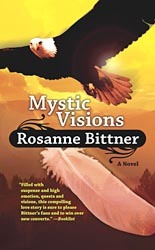 "Rosanne Bittner has established a reputation for realism in her writing about Native Americans. Extensive research backs up her historically accurate stories about America's Old West. now, she once again proves her reputation with a story filled with history, action, and romance, told through realistic, unforgettable characters. "In 1833, Star Dancer, a Sichangu (Brulé Sioux) is promised in marriage to Stalking Wolf, an Oglala warrior whom she has never met. What begins as a loveless union develops into a moving story of a man and a woman led by powers beyond their control. Dreams, visions, and mystic experiences fill this provocative love story that launches a saga about the Lakota and their first meeting with the White Man. 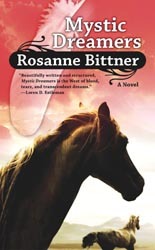 "For readers of Rosanne Bittner's previous books, this novel ends your long wait: a new story in a collectible format, sure to bring you many hours of reading pleasure. 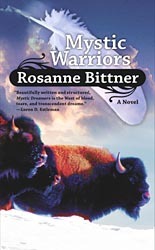 For new readers, this novel is your introduction to a wonderful author, one who is sure to entertain you and hold you captive with her incredible ability to transport you to a time long since lost, when buffalo really did roam the plains, honor was the most valuable asset for men and women, and respect and appreciation for the Earth were foremost. "'Wakan Tanka nici un.' -- May the Great Spirit go with you and guide you." Order now: In print through Amazon.com all ebook formats. Follow the continuing story of Rising Eagle and Buffalo Dreamer, from 1836 - 1851, as they continue to cling to the Lakota Way through the white man's growing intrusion into the Black Hills and into the vast hunting grounds of the Lakota. In this story sure to entrall both first-time readers and devoted fans, we follow Buffalo Dreamer, Rising Eagle, and their children through the great Indian wars and the settling of the West, where, in addition to the risks and rewards of daily life, they and their Lakota tribe must face the influx of white settlers and soliders into their lands and into their lives. In MYSTIC VISIONS, we experience Buffalo Dreamer's increasingly powerful visions of the bluecoats and a coming war. Learn the fate of Big Little Boy and Never Sleeps, and of Never Sleep's mother, Fall Leaf Woman. And we meet the one who is destined to lead the Lakota People in their greatest trial ever, Crazy Horse. Feel the pride, dream the dreams, go into battle with Rising Eagle and Buffalo Dreamer. Watch their children grow. Learn about the power of the Sacred White Buffalo and of faith in the Feathered One. MYSTIC VISIONS delves deeply into Lakota culture and religion. Emotions run high in this sequel to MYSTIC DREAMERS -- prophetic visions, romance, and heart-pounding action scenes are certain to enthrall new readers and renew enthusiasm among lifelong fans. The White Buffalo is a sacred and holy creature to the Lakota. Those who have seen the mystical creature are said to have been blessed. 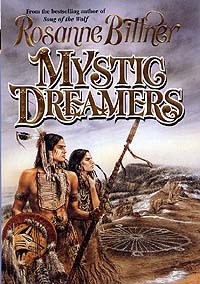 In the first two novels of this series, MYSTIC DREAMERS and MYSTIC VISIONS, Buffalo Dreamer, a holy woman, is so blessed. She and her husband, Rising Eagle, have not only seen the white buffalo, they have eaten of its heart and have been told by the white buffalo herself that as long as the Lakota have the skin of the white buffalo, all will be well. But all is not well. White hunters have stolen the sacred skin and much trouble has befallen the Lakota. Settelers continue to invade Lakota territory, backed by vicious cavalry fources who massacre women and children. The white man honors no treaty. The Lakota are starving. Their anger is growing. Led by Rising Eagle, his son Brave Horse, the famed Sitting Bull and the prophesied savior of the Lakota, Crazy Horse, a great force of Lakota, Shihenna and other tribes wage war upon the white man. For they are the MYSTIC WARRIORS, battling to regain the land stolen from them, protect the precious buffalo the white man wantonly destroys, and searching for the sacred white robe that has wrongfully been taken from them. 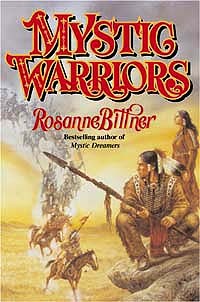 With great action, romance, and suspense, MYSTIC WARRIORS continues the story of the characters we have come to love: Buffalo Dreamer, Rising Eagle, Brave Horse, Yellow Hair, Fall Leaf Woman, Spirit Walker, and William, the unknown son of Rising Eagle. Page Copyright © 2004, 2011 by Michelle Crean & Rosanne Bittner. All Rights Reserved.